Now is a great time to get introduced to the world of Xamarin. So, after that short intro, I would like to get started on answering the question asked above. To save you some time, here’s what you need to know when it comes to the development environments. Download Xamarin Studio. It will let you develop for iOS, Android, and Mac. No Windows UWP, Windows Phone compatibility here. Xamarin Studio has been decommissioned for Windows in favor of world’s best IDE available, Visual Studio. Xamarin now comes with Visual Studio Community and Visual Studio 2015 Update 2 forward. In this configuration, you can develop for iOS*, Android, Windows UWP, Windows Phone, etc. This configuration is used by most enterprise teams. No surprise there. still requires a Mac build host. Develop native apps for iOS using C#.NET. In a cross-platform app, the platform specific code lives here. Develop native apps for Android using C#.NET. In a cross-platform app, the platform specific code lives here. Develop cross-platform apps using single code-base for UI as well using C#.NET and Xaml. Now, I believe this is where rubber meets the road. How should you start? You have two options to go about it, the right way, or the other way. I am of the opinion that you should start with basic knowledge of native platforms before jumping onto cross-platform train. Let’s face it, if you don’t familiarize yourself with underlying bits and pieces of native framework, you will spend a whole lot of time and energy on bad workarounds after you’ve already started your first real world app – beyond Hello World!. 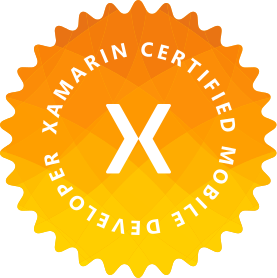 Once you have completed that exercise in the native worlds (say iOS and Android), you can step into Xamarin world. Now, if and when a customization is required, due to Xamarin’s limitations or bugs (yeah I said bugs), you will have an idea on how to handle it in native code. But if you are impatient to see your code glory show up on cross-platform devices, you can also go the other way. The faster way to get your app up and running on cross-platform devices is Xamarin.Forms. With this approach, you can take your C#.NET and MVVM (or MVC) skills to town and whip up a quick app that has some basic functionality in it without knowing anything about the underlying native code magic. This approach is well marketed and is very exciting. Lots of new developers and developers with WPF experience are tempted to go for this option and put their skills to test. Nothing wrong with that. Xamarin.Forms is still new (at the time this article was written) and not everything works as expected. Also has bugs (hopefully open-sourcing will help expedite the fixes). If/When hit with a Xamarin limitation or bug, requires research and study of native code for workarounds. Using Xamarin.Forms for complex apps will lead to a slew of custom code in the native projects that can become hard to maintain with newer OS versions. Xamarin University is the best place to learn mobile development using Xamarin. There are several tracks that you can follow depending on your skill level and professional goals. One of the first thing you should try to get done, if possible, is to get certified. The certification lasts 1 year and requires about 17 live online classes and a comprehensive exam at the end. The exam will cover, OOP, iOS, Android, Xaml and other general knowledge in mobile. In conclusion to my rather long post, take a look at Xamarin for your personal and professional mobile needs. For individuals who want to get into mobile development or have native mobile experience and want to go cross-platform, this is a great option – specially now that it is part of the Visual Studio Community edition. For businesses, It will help reduce the cost by not hiring specialists for each platform you want to go to market with, and will reduce the time to market somewhat. For a discussion or question, leave a comment below. Enjoy! Xamarin’s James Montemagno did a nice intro to Xamarin.Forms here.